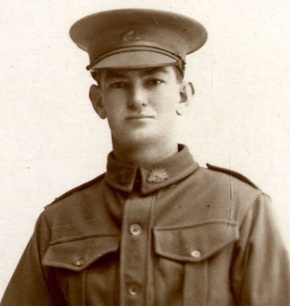 Harold Carseldine was a young man of 24 and a theology student at Angus College in Adelaide, a long way from his home in Queensland, when he enlisted on 11 May 1915 for service with the AIF. Twenty one days later he was on board HMAT Geelong (A2) and heading off to war as a reinforcement for the 10th Battalion. ..... With this rapid departure one wonders if he had time to return home to see his parents and say goodbye. One wonders if he had time to say other important goodbyes. One wonders if he knew other men on that transport ship with whom he could share conversations about what might be awaiting them all. He may have known no-one at all. If that was the case a shared commitment to duty and purpose is likely to have forged a bond on a journey to a known destination but an unknown outcome. For Harold Carseldine we now know what he would not have known – his fate. This brave young man died of wounds received fighting on the battlefields of Gallipoli on 8 October 1915, just 2 months before the evacuation of the ANZACs commenced and only weeks before his Battalion, the 10th, was withdrawn to Lemnos, having been present since the Landing on 25 April. For his family, especially his parents Joseph and Sarah Carseldine one can only imagine the grief.His sacrifice is recorded on the Lone Pine Memorial but there was no record of a grave. A mystery as he died of wounds in the 7th Field Ambulance. So what happened? There is nothing noted in his official service records. The Australian War Memorial had no additional details. Exactly where was Harold Carseldine laid to rest? As for so many this question is unlikely to be answered. There is no known grave for this young man in Turkey where he fell. However, on 22 October 2014 Helen Holdey (Qld) called the RSL Virtual War Memorial Team. 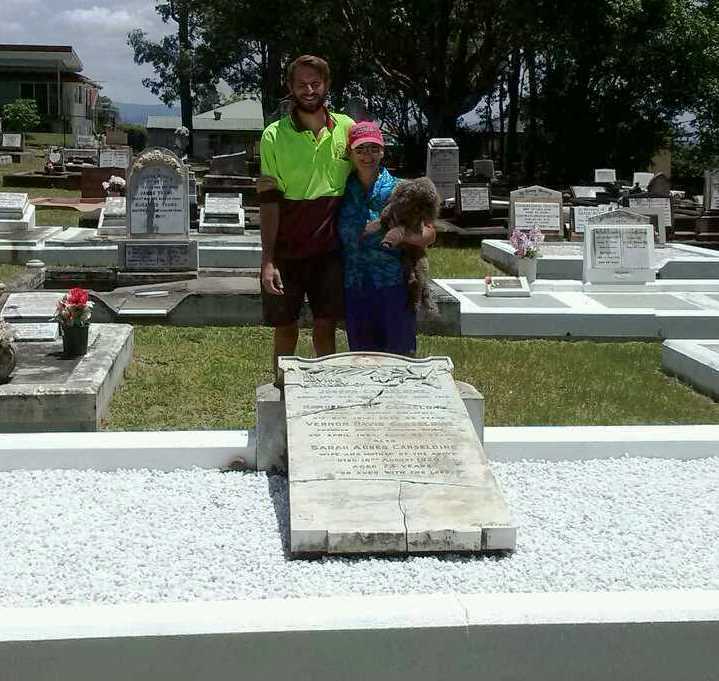 Helen had agreed to help a friend with the cleaning up graves in the Bald Hills Cemetery. Never one to do anything by halves Helen systematically tackled the entire site. 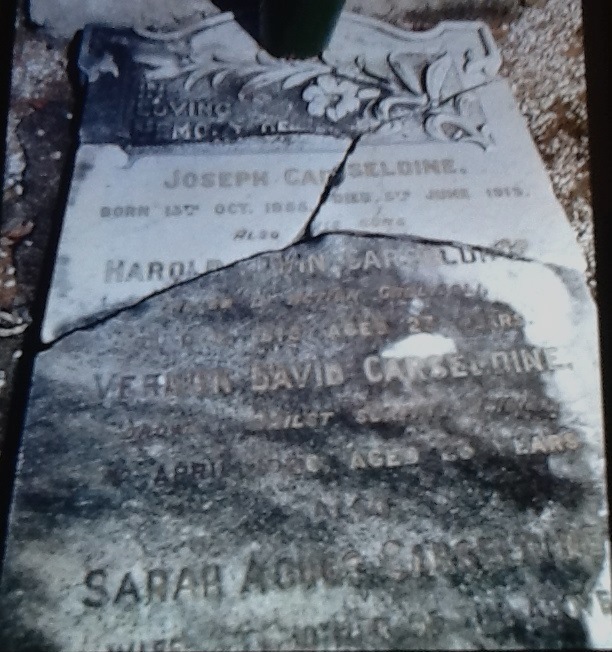 In doing so she came across the headstone of the grave for Joseph and Sarah Carseldine. It was damaged and the script was badly deteriorated but one word caught Helen’s eye. “Gallipoli”. Harold’s sacrifice was recorded on the headstone of his parent’s grave. The life of a precious son remembered. In spirit at least, he was reunited with his loving parents. Helen Holdey wanted to know more. With the team at the RSL Virtual War Memorial, Harold’s story was pieced together. As Helen came to know more she became more determined to ensure that his sacrifice was honoured and she fought to gain support for the restoration of the grave site and headstone. Helen met with the Head of Cemeteries on the 19 November 2014 in addition to the Local Member for Bracken Ridge. It was at that meeting that she requested the restoration. I can imagine that everyone that Helen spoke to about this would have understood that she was never going to accept ‘No’ as an outcome. On the 3 December 2014 the project manager for cemeteries informed Helen that her request had been approved. Helen is convinced that it was fate that the project manager, Darren, was a veteran himself. The restoration began on the 4/2/15 and was completed on the 5/2/15. Tom was the lovely young stonemason who proudly carried out the restoration. And so, nearly 100 years after he enlisted in far-away Adelaide, Harold Carseldine has been remembered and honoured by his community and his story recorded thanks to a self-described ‘accidental historian’, Helen Holdey. She felt compelled to know his story and now she does and has shared it for all to see. Helen has honoured him and his parents in a truly remarkable way. We honour his service and sacrifice. To read more about Harold click here.